"I’m excited about the next part of my life and that’s being home with the kids and my wife Heather and spending time with them and going to all of the things I haven’t had a chance to do over the last 18 years in the spring and summertime. Being home is going to be fun." Westbrook tells Rains that he entered the season preparing to pitch another season but was only 50-50 on whether or not he would actually follow through on that plan. "The interest that I was getting wasn’t significant enough for me to go through the grind of another year and be away from my family," Westbrook said. Originally selected by the Rockies with the 21st overall pick in the 1996 draft, Westbrook signed with Colorado out of high school but didn't make his big league debut until 2000 with the Yankees. The Rockies traded him to the Expos, who flipped him to the Bombers in a trade that netted Hideki Irabu. Westbrook would appear in just three games with the Yankees before being traded to the Indians, with whom he would spend the next nine seasons of his career. "…getting traded to the Cardinals was probably the best thing that happened in my career. It’s such a storied organization and the atmosphere I witnessed there, and being in the playoffs all those years. Getting a chance to pitch in the World Series and winning game six in 2011 was pretty special and something I will always have." Westbrook's career will come to a close with a 105-103 record, a 4.32 ERA, 965 strikeouts and 571 walks in 1747 2/3 innings at the big league level. Among 147 pitchers to have thrown 1000 innings since 2002, Westbrook (and his sinker) produced a 58.7 percent ground-ball rate that trails only Brandon Webb and Derek Lowe in that time. The 36-year-old has earned more than $71MM in his career (including his signing bonus out of the draft). We at MLBTR extend our best wishes to Westbrook and his family in his post-baseball life. The Indians don't have any current interest in Jake Westbrook, who pitched in Cleveland from 2001-10. Westbrook hit free agency after the Cardinals bought out his 2014 option but it's been a pretty quiet winter of rumors about the veteran right-hander. Hoynes reported in October that the Tribe would "keep an eye" on Westbrook but nothing seems to have come of that interest. Westbrook, 36, posted a 4.63 ERA in 116 2/3 IP with the Cardinals last season and had trouble missing bats, as he recorded only 44 strikeouts (against 50 walks). A right-handed power bat isn't high on the club's priority list as the Indians are focused on adding pitching. Hoynes figures the Indians will post a $20MM bid for Masahiro Tanaka since they "have nothing to lose" in doing so, given that only the team that signs Tanaka has to pay the $20MM posting fee. While the Indians may check on the Japanese righty, however, Hoynes thinks larger-market teams will offer Tanaka a much bigger contract offer. Hoynes thinks Ubaldo Jimenez will end up signing with the Blue Jays, Diamondbacks or Yankees. The Tanaka signing could affect this prediction as the latter two teams are known to be heavily interested in Tanaka and Toronto will likely be interested as well. Francisco Lindor is only likely to see time as a September callup, and that's only if the Indians' star prospect rebounds from a 2013 back injury and impresses in his first taste of Double-A and Triple-A baseball. Lindor's progress will also naturally impact the Tribe's future decision on Asdrubal Cabrera, who will be a free agent next winter. Cleveland is known to be listening to trade offers for Cabrera, who is coming off a down year in 2013. The Cardinals have declined their half of the $9.5MM mutual option on Jake Westbrook's contract, according to Derrick Goold of the St. Louis Post-Dispatch (on Twitter). Westbrook will be paid a $1MM buyout. The 36-year-old Westbrook posted a 4.63 ERA in 116 2/3 innings for the Cards this season, maintaining a strong ground-ball rate (56.3 percent) as has come to be expected of the veteran. However, his already low strikeout rate dropped, and he wound up posting a career-worst 44-to-50 K/BB ratio. The writing was on the wall for Westbrook, as he was left off the team's postseason roster. Typically very durable, Westbrook also saw a pair of stints on the 15-day disabled list in 2013, missing a month with elbow inflammation and another two weeks with a strained lower back. Westbrook may be able to find a Major League deal this offseason in free agency based on his track record, but the two DL stints and the fact that he walked more batters than he struck out in 2013 would mean his guarantee would be just a fraction of this season's $8.75MM salary. The Cardinals are well-equipped to move on from Westbrook, with Adam Wainwright, Michael Wacha, Shelby Miller, Lance Lynn, Joe Kelly and Jaime Garcia all present as internal options for the starting rotation. Re-signing Matt Capps to a minor league deal is not an indication the Indians are going to part ways with closer Chris Perez. If tendered a contract by the Indians, MLBTR contributor Matt Swartz projects a $9MM salary for the arbitration-eligible Perez. If Perez is traded or non-tendered, Hoynes names Cody Allen and Bryan Shaw as the best in-house replacements. Right-hander Jake Westbrook is definitely someone the Indians will keep an eye on this off-season, if healthy. The Cardinals are expected to decline their half of Westbrook's $9.5MM mutual option in favor of a $1MM buyout. The 36-year-old spent nine years in Cleveland before being acquired by the Cardinals at the 2010 Trade Deadline. Corey Hart is a tough fit for the Indians because his knee surgeries make it unlikely he can man the outfield and they already have Nick Swisher at first and Carlos Santana at DH. While the Indians have gambled on buy-low contracts for pitchers coming off an injury, Hoynes cannot recall such a deal for a position player. MLBTR's Steve Adams predicts the open market will bear a one-year, $8MM contract for Hart with an additional $2-4MM in incentives. Hall of Fame and Cardinal icon Stan Musial passed away yesterday at the age of 92. Today, tributes are pouring in ranging from fans outside the Stan the Man statue at Busch Stadium (St. Louis Post-Dispatch video) to the White House (h/t MLB.com's Jenifer Langosch). Daniel Solzman of Redbirdrants.com even suggests the Cardinals name the playing field at Busch Stadium in honor of Musial. The Cardinals are holding their 17th annual fanfest this weekend and, while the Musial official memorabilia booth was closed today in tribute to the St. Louis legend, players still made their appearances and made some news. Chairman Bill DeWitt, Jr. says the club is prepared to increase payroll in the coming years, tweets Derrick Goold of the St. Louis Post-Dispatch. Goold adds the 2013 payroll is around $115MM. Adam Wainwright, who is entering the final year of his contract, admitted the Cardinals approached him about a contract extension during the final month of this past regular season, Goold reports. Wainwright said he wanted to focus on the playoff stretch and "it wasn’t going to hurt my case to just wait it out and see where some of these guys signed." On the upcoming Wainwright extension talks, Goold, within the same piece, quoted GM John Mozeliak as saying, "It’s going to be long. It’s going to be expensive." Wainwright has become a mentor to pitching prospect Shelby Miller, Goold writes in a separate article. Miller, who will compete for the fifth spot in the starting rotation, says he doesn't know what he was thinking last offseason when he "was trying to be a beach bod" with his workout regimen. Miller's performance suffered and the club questioned the right-hander's conditioning. Enter Wainwright who exchanged texts with Miller throughout the season and challenged him to reach training camp at a weight that would help his strength and durability. While Miller has gained enough pounds to reach his playing weight, Jake Westbrook's outlook on the offseason is to copy last year's regimen in hopes of slimming down, writes Jenifer Langosch of MLB.com. "It worked out so well last year that I thought I would just do it again," Westbrook said. The injury reports on Chris Carpenter, Jaime Garcia, and Rafael Furcal are positive, according to Langosch. Mozeliak says second base is Daniel Descalso's "job to lose," but he is open-minded about Matt Carpenter making a push for playing time there, writes Langosch. Mike Matheny told the St. Louis Post-Dispatch he only became the Cardinals' manager because of losses he sustained in a failed real estate venture. A Missouri judge recently ruled Matheny and his wife owe more than $4MM from that deal plus interest and court costs. Matheny will earn $750K in the final guaranteed year of his contract. It is highly unlikely the Braves will attempt to sign Josh Hamilton because they typically don't pursue top-of-payscale free agents who come with questions, tweets the Atlanta Journal-Constitution's David O'Brien. Adrian Gonzalez told Dylan Hernandez of the Los Angeles Times that he felt he struggled this season because he was "trying too hard." Gonzalez was even disappointed by his career-high 47 doubles. Also in the profile, the Dodger first baseman discussed the responsibility he feels as a Mexican-American athlete in a heavily Latino city. The Dodgers will continue to strengthen their starting rotation which could lead them to target Zack Greinke, writes Steve Dilbeck of the Los Angeles Times. The Cubs will need to acquire two or three starting pitchers merely to put a representative team on the field, opines Gordon Wittenmyer of the Chicago Sun-Times. Wittenmyer adds don't look for the Cubs to sign Greinke or Jake Peavy, as Shaun Marcum and Anibal Sanchez are more in line with the current front-office thinking. Jake Westbrook, rehabbing from discomfort in his right oblique, threw a bullpen session this morning and hopes to be available for bullpen duty if the Cardinals advance to the NLCS, reports MLB.com's Jennifer Langosch. The throwing schedule for Westbrook is fluid because he will be leaving the team after Game 2 to be with his wife, who is scheduled to be induced into labor for the birth of their fourth child on Thursday. The Cardinals will win the World Series in six games over the Tigers, predicts Ken Rosenthal of FOXSports.com in his playoff prognostication column. The Stephen Strasburg shutdown will test all of Nationals' intangibles: its confidence, cohesion, and just plain stubbornness, writes Thomas Boswell of the Washington Post. Jake Westbrook will miss his next start for the Cardinals with a right oblique injury. MLB.com's Jennifer Langosch reports Chris Carpenter is a possibility to replace Westbrook on Thursday. Carpenter, who has yet to pitch this year after undergoing surgery to correct thoracic outlet syndrome in his right shoulder, is set to throw a simulatated game tomorrow, but Langosch says the team could switch the schedule should they want Carpenter to step in immediately. The Pirates are still developing their offseason plans for Gerrit Cole, the first overall selection in the 2011 draft, according to Rob Biertempfel of the Pittsburgh Tribune-Review (via Sulia). "We've got to spend some time with him and see where we can place him," Biertempfel quoted GM Neal Huntington as saying. Cole was roughed up in his final Triple-A start (eight runs in just two innings), but Huntingon was philosophical, "The biggest lesson is, Triple-A (batters) can hit 100 mph (pitches). If you keep coming with 100 mph, they're going to keep hitting it. You've got to use all your pitches. Things snowballed on him, things got a little quick for him. He's going to be better for it." 5:22pm: Westbrook will earn $8.75MM in 2013, while the 2014 mutual option is for $9.5MM with a $1MM buyout, according to Joe Strauss of the St. Louis Post-Dispatch (Twitter link). 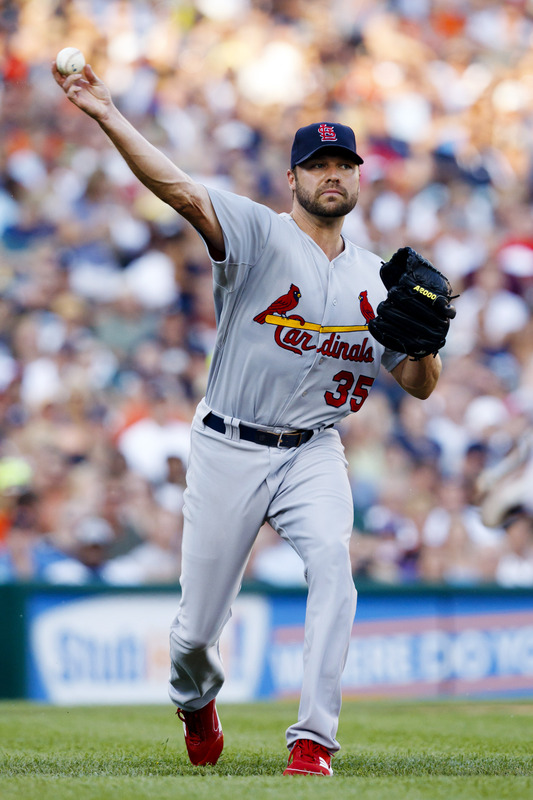 4:04pm: The Cardinals announced that they have agreed to a contract extension with Jake Westbrook that will keep the right-hander off of the free agent market for at least one more year (Twitter link). The deal covers the 2013 season and adds a mutual option for 2014. Westbrook's previous contract, a two-year, $16.5MM agreement signed following the 2010 season, included a $8.5MM mutual option for 2013. Shapiro, Robinson, & Associates represent Westbrook, who turns 35 next month. Westbrook has started 24 games this year, posting a 3.50 ERA in 154 1/3 innings. His ground ball rate is characteristically high (59.2%) and his strikeout (5.5 K/9) and walk (2.4 BB/9) rates are right around his career averages. His average fastball checks in at 90.7 mph this year and he's generating slightly more swings and misses than usual (7.8%). The Cardinals acquired Westbrook two years ago in the three-team trade that sent Ryan Ludwick to the Padres. Westbrook projects to join Adam Wainwright, Lance Lynn, Jaime Garcia and, the Cardinals hope, Chris Carpenter in St. Louis' rotation next year. Kyle Lohse is on track to hit free agency this coming offseason. Cardinals righty Jake Westbrook "fully intends on exercising his half of mutual option for '13" after the season, tweets Joe Strauss of the St. Louis Post-Dispatch, but the pitcher has no idea what the Cardinals will do. Westbrook's contract, signed in November of 2010, includes an $8.5MM mutual option for 2013 with a $1MM buyout if the club declines and no buyout if the player declines. Given Westbrook's solid 2012 performance, this could be one of the rare mutual options where both sides are exercised. The 34-year-old owns a 3.61 ERA, 5.8 K/9, 2.3 BB/9, 0.57 HR/9, and 57.7% groundball rate in 127 innings this year. The Blue Jays are saying they will not give a hitter a contract of more than five guaranteed years, though they'll likely have to violate that policy if they want to sign Prince Fielder. The Brewers, Cubs, Nationals, Indians, Mariners, Orioles, Rangers, Rays, and Pirates are all considering non-Fielder upgrades at first base. Carlos Pena, Casey Kotchman, and Derrek Lee remain unsigned, among others. Some within the game believe that Joakim Soria and Carlos Marmol could be had at the right price. The Cubbies are said to be planning a "complete and total rebuild." Both Kyle Lohse and Jake Westbrook remain available, and the Rangers may be willing to trade Matt Harrison for a more established starter. Most believe Yoenis Cespedes will sign for more than the $30.25MM Aroldis Chapman received because as a position player, he carried less risk. A larger number of interested teams and the new collective bargaining agreement will also help his cause.